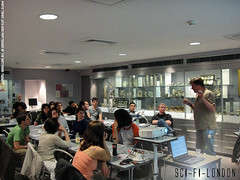 SFL: Lab or Sci-Fi-London: Lab Programme is a series of workshops, discussions, stand up comedy, debates, talks and the chance to interact with Sci-Fi filmmakers and writers. "This workshop has a mission and needs your help! 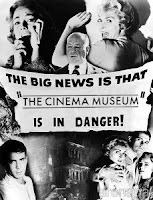 At SFL we want to see more low-budget, British, science fiction films made: films that look into the near future and challenge some of the decisions humanity is making today. Will there really be clones mining the surface of the Moon for Helium 3? Will the sea levels have risen so high that there are only a few survivors living in giant Arks? 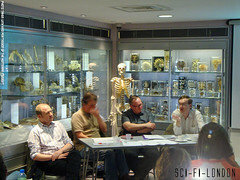 Using the fantastic Hunterian Museum as inspiration and with the professional skills of a screenwriter and an author to assist you, try your hand at devising a plausible sci-fi movie idea, set in 2050. You could steer clear of bug-eyed aliens and focus on something closer to home. Whether it is Fantastic Journey, Coma or Moon in feel, make it feel real. By the end of the day, we want you to have worked out your basic drama and plot." 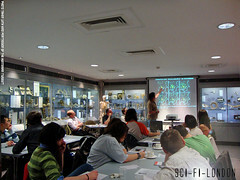 In the build up the Lab it had a real Sundance feel to it; it was about developing a treatment for a film, attendees were all interested in filmmaking or at least developing a story for a film, there was going to be guidance from people in the know and there was the promise of cylinder firing coffee. 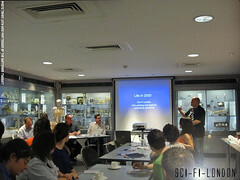 All in all, definitely my kind of thing and I was lucky enough to get a place for the Life in 2050 Film Treatment Workshop as places were snapped up really quickly. The gist of the Treatment Workshop was that it was to be the opportunity to gleam insight from the people who understood the Science as well as the Fiction in Science Fiction and then have that insight shaped into a plausible sci-fi movie idea, circa 2050. 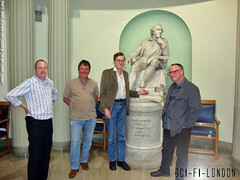 The workshop was hosted by science fiction writers Philip Palmer and Tony Ballantyne representing the Fiction and Environmental Scientist Jonathan Cowie and Microbiologist Dr. Simon Park to cover the Science part. 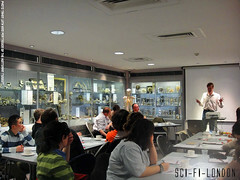 Introduction to the Film Plotting and Science coherence workshop and the panel by Robert Grant (Literary Editor for SCI-FI-LONDON). 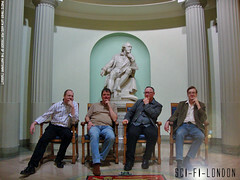 He also set the scene by laying down the foundation theme for the day “extrapolation”. Think about/discuss someone you know. Use that persons personality/traits as the basis for a character. Discussion of character driven plots. 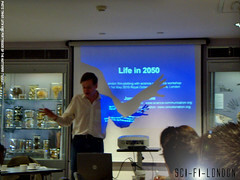 An interesting stimulus talk from environmental Scientist Jonathan Cowie about the importance of accurate Science in Science Fiction and what we can expect from life around the middle of this century. Forthcoming surprises include; a certainty that technology will advance, increases in population a shortage of resources including; energy, water & food culminating in John Beddington’s “The Perfect Storm”. But all is not lost because we can change. Cowie also pointed out that possibly Artificial Sentience may be a more important breakthrough than Artificial Intelligence. 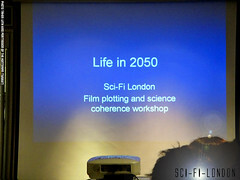 It was about that point for the first time the relevance of SCI-FI-LONDON 9’s theme of Life in 2050 dawned on me. It wasn’t some random year from the future - it could well be the crossroads of survival of the earth. Brainstorm ideas and develop them into scenarios. One of the throw out ideas from this session was, well I think Tony Ballantyne described it perfectly on his blog. Turns out earth needs phosphorus for fertilisation and “has no synthetic alternative, is being mined, used and wasted as never before.” The typical cycle of phosphorus helping plants grow, then running off into the seas to be returned by volcanoes has been interrupted by man, hence catastrophe when we run out of phosphorus. Naturally I spun off to the future world of “BONES” where although man had ruined the world in a war he has come to terms with most of the problems facing the biodiversity (apart from the phosphorus shortage), split humanity into two societies, 30% in their walled off utopia supported by the other 70% in a wasteland “harvesting” human bones to ensure Utopia’s ongoing survival. The majority of the both unaware of the other societies existence. - Bone Raiders marauding raiders that service the black marker by digging up, procuring or de-boning both humans and animals. Years without protection in the wastelands have caused the elements/irradiated bacteria to mutate the Raiders - Hell I don’t know what the changes are; increased resilience, immunity to something or other, sight in the dark, increased speed/strength, webbed arms, an addiction to calcium, etc. But what ever it is I’m sure it will be important later in the plot. 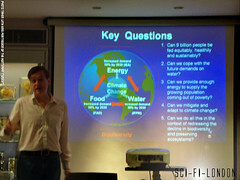 The fragile balance between earth and the two societies is ticking along but complications arise (thanks Dov) as Utopia has stockpiled sufficient phosphorus to fuel there needs for the foreseeable future and will no longer need the harvesting colonies. Into this world comes "BONES" a freak of nature. Remember the genetically modified life forms? 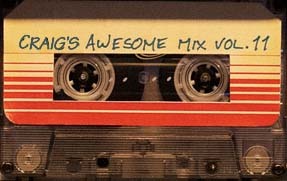 Well one of them via a plot device (only to be revealed later on in the story) has developed sentience and whilst hooked up to the life support/gene infusion pod becomes self aware and although it only has the mental capacity of a young child it’s developing and learning from its environment. BONES’s increased growth & modification means that it has a big deformed body composed mainly of super bone making him stronger and almost unbreakable. Yea I’m still going through a film tough guys really aren't just regular guys that need to find there inner hero, they are film tough guys for a reason period. Just realised that BONES always has a stogie hanging from his lip because his body doesn't generate some sort of chemical that’s needed so he gets it from sucking in the fumes from dead leaves or something or other. Anyway BONES has been adopted by one of the female harvesters who wants to mother him. BONES has also got the attention of one of the senior Bone Raiders who sees the potential in him as a living weapon. A tug of war over BONES develops between the female harvester and the Bone Raider. Anyway that was off the top of my head and also unfortunately signalled the end of my day as I was off exploring the wastelands with the Child warrior saviour. 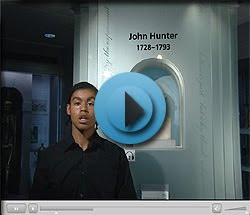 Tour of The Hunterian Museum - Also feeding the stimulus gland was our location as the workshop was held in the awe/fear inducing Hunterian Museum part of The Royal College of Surgeons of England. 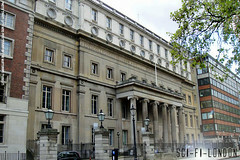 The Hunterian Museum has to be seen to be believed it’s like an Encyclopaedia Incredibilica of animal and human specimens. It’s a little gruesome and the only reason you haven’t seen pics of the displays pasted all over the Internet is because there are strict rules governing public exposure to human tissue. Stimulus talk from Microbiologist Dr. Simon Park about Microbes: Tales of the unexpected - turns out Bacteria are smart, communicate, hunt in packs, are very active, travel light and outnumber us. I guess the only point not addressed is why they haven’t conquered the Earth yet? Brainstorm ideas and develop them into scenarios add them to the “plot”. 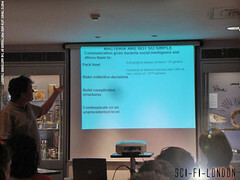 Both Ballantyne and Philip Palmer supplied interesting notes that could be used for reference. Ballantyne’s notes where about extrapolating ideas. His notes are copyrighted so I can’t recreate them here but they covered; Orange alien landscapes that turn out to be the insides of a “The Jar of Tang” and other cop outs see here: http://www.critters.org/turkeycity.html), “Great Science Fiction Inventions” about inventions that drive plots and a list of points to consider when “How Does an Idea become a Story”. In theory by the end of the day we should have worked out a basic drama and plot. However and as I explained earlier I was sidelined by a severe B Grade Sci-Fi flick that needed immediate casting with undiscovered talent and further development. 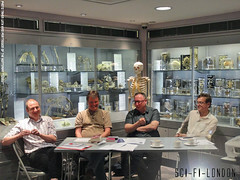 Add to this the over- stimulation caused by the specimens in the Hunterian Museum and the great talks from both Jonathan Cowie & Dr. Simon Park covering science fact that was more incredible than most sci-fi we see on screen today. Spinning us off into a myriad of different directions & possible themes whilst making it blinding obvious that nature truly is more fantastic than anything we can imagine. All in all I had a terrific day, great stimulating talks from genuinely interesting people, interacting creatively with like minds as well as walked away with some useful insight that I hope to forward. 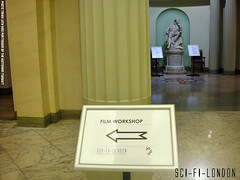 I hope that this workshop serves as test case for SCI-FI-LONDON doing more of this kind of stuff particularly Labs with writers and filmmakers shaping ideas.